First Tina Fey stripped for David Letterman. Now he has Howard Stern trying to kiss him. Late night talk show host David Letterman is counting down to his final show next week. Some of his favorite and most notable guests are returning to say goodbye — including Howard Stern. Stern has appeared on Letterman’s show nearly 20 times. Letterman booked Stern on his show before Stern found success in radio syndication. “Is this goodbye? Is this our final time together?” Stern asked Letterman during the taping of the show on Monday. “No. 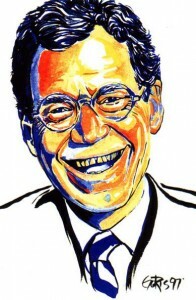 What are you going to do?” Letterman asked while trying to get away from Stern. “Come here. Come here,” Stern continued to say. That’s when Letterman grabbed Stern’s hand and kissed it. That wasn’t enough for Stern. He urged Letterman to come in for a hug — but then puckered his lips and tried to kiss him as Letterman threw to a commercial break.